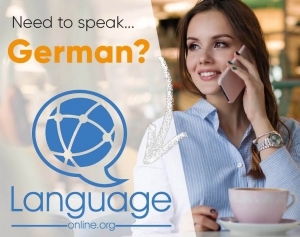 Hello everybody and welcome to this article about German future tenses and language-easy.org! Whether you want to express events that will take place later on or you want to make plans – you need the German future tenses! Even if you want to express desires or just tell your German prof when you will have handed in your assignment – these tenses can be really useful. Of course, you know how to form the future tense in your own language. But do you know how to form and use them in German? Maybe, it’s a lot simpler for you as you might think. In the following, we will have a look at some tables and examples that will show you everything you have to know about German future tenses. By the way, we will need some basic knowledge about German grammar. In case you don’t feel to prepared, just have a look at our articles about German word order and German verbs and their conjugation. Furthermore, the article about the conjugation of “haben & sein” can be useful. Well, you might have noticed that I’m always about German future tenses in plural. So, there are two kinds of future tense in German. Luckily, their form and use are really different. First of all, we have the “Futur 1”. As other German tenses, you can also compare it directly to its equivalent in English, the future tense. Luckily, there are no other forms of future tense in German, although you have to keep in mind that there is the futuristic present. Second, there is the “Futur 2” which has its direct equivalent in the English language in the future perfect tense. Of course, it also describe actions that will be completed in future actions. In the following, we will have a close look at the exact construction and use of each one of the German future tenses. 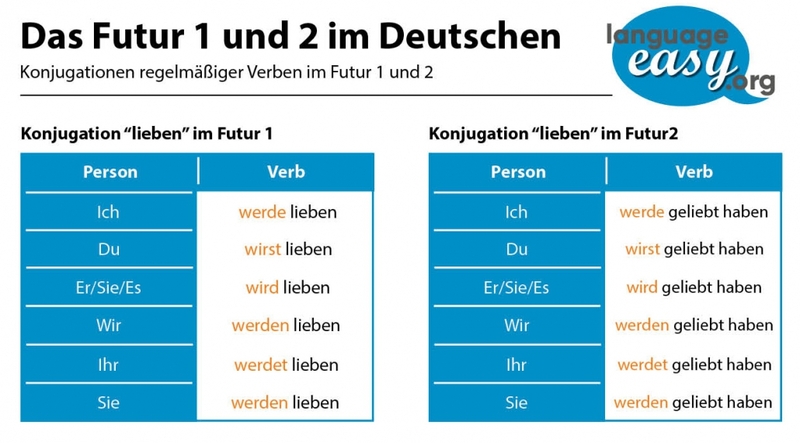 Well, in this part of the article, we will have a look on the details of how to form and to use German future tenses. Of course, you now by now that there is the “Futur 1” and the “Futur 2” tense. So, let’s start in a chronological order and look at “Futur 1”. First of all, the “Futur 1” tense expresses the intentent to do something. So, you can actually compare it to the will-future in the English language. Well, remember that – in English – you form the will-future by using ‘will’ and after that the infinitive form of the verb. Actually, in German its quite similar. Here, you use the different forms of the verb “werden” as an auxiliary verb and after that the infinitive form of the main verb. Maybe you find this order quite useful. Of course, you have to conjugate the verb “werden”. In the following, you will see a table of its conjugation in the present tense. So, place your subject first, then the corresponding conjugation of “werden”. After that, Follow regular German rules of word order for words and phrases after the appropriate conjugation of “werden”. Finally, place the infinitive of your main action verb at the very end. Well, let’s have a look at some example phrases which will illustrate what I was talking about. “Ich werde zur Schule gehen.” – I will go to school tomorrow. “Sie wird morgen zu mir kommen.” – Tomorrow, she will come to my place. “Wir werden bald da sein.” – We will be there soon. Here, you can identify clearly the way of forming the first one of German future tenses. Actually, it’s really easy as it is some similar to the will-future in the English language. Finally, we come to the next form of German future tenses. The so called “Futur 2” expresses acts that will already be done in the future. Well, actually, I have already used it’s English correlation in my first sentence. So, you see that this form is not too hard to understand either. So, the construction of this future tense is different from “Futur 1”. Of course, you have to put the subject first, then a form of “werden”. After that, you need the past participle form of your main verb. Finally, you need the auxiliary verb. For that, you can use “sein” or “haben”. So, let’s try to order the different forms in the following table. For sure, you will notice that the forms of “werden” are still the most important ones. Furthermore, you now have to master the past participle forms of your main verb. Well, in this case will have use the verb “tun” (to do) and its past participle form “getan” (done). Finally, let’s use the our construction plan from above and the the forms from the table to form some examples. Of course, you will see that it’s not so difficult to apply this form of German future tenses. “Wir werden deutsche Zeiten gelernt haben.” – We will have learned German tenses. “Er wird sicher 200 Brezen gebacken haben!” – “For sure, he will have baked 200 Pretzels! Exactly, German can be so easy sometimes. Well, I think you should have understood the different forms of German future tenses by now. Hopefully, it also became clear for you, in which circumstances to use them.